A gaming set for PS4 at a very attractive price! The set consists of a gaming headset, along with a dual charge base for controlIers, thumb grips and a charging cord for joystick. 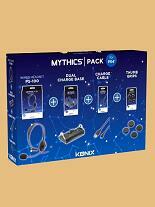 Designed for gamers, this set provides you with the most complete equipment to play without limits.